Every building needs a foundation to connect it to the earth, to anchor it and to provide a stable platform over decades or centuries. 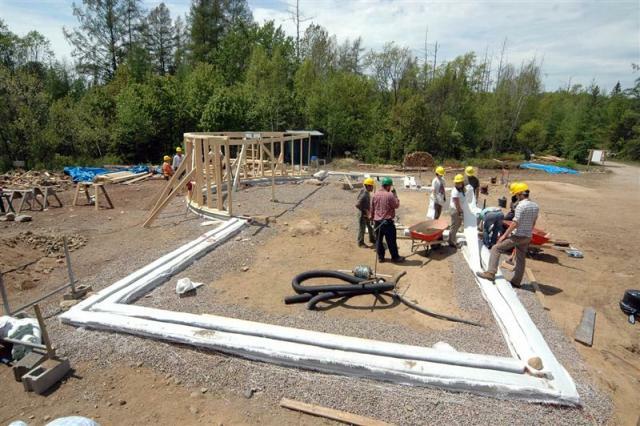 The choice of foundation style and materials will obviously be very important to the successful life of the building. What kind of "boots" should we give our building? 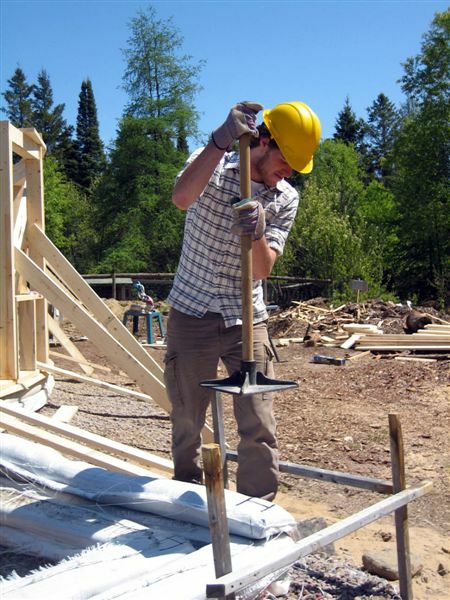 To create a stable, long-lasting base for the building. To minimize or eliminate the use of Portland cement, one of the most energy intensive and polluting materials used in building construction. The exterior walls of the building rest on a grade beam foundation. 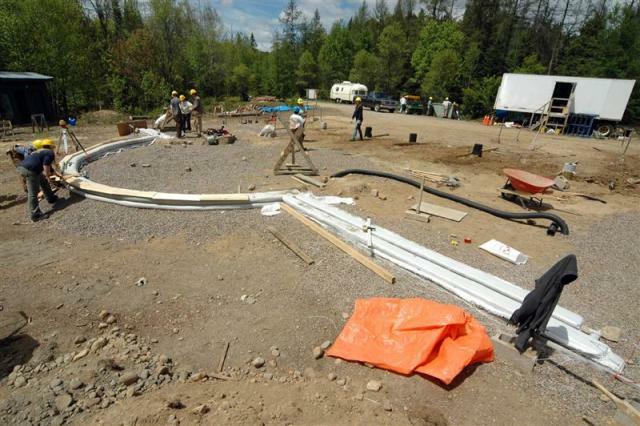 Using a grade beam means we didn't have to excavate large holes or trenches in the site, and it means that we keep the whole building envelope above grade. Since conventional basements use vast amounts of Portland cement, we did not want to pursue that idea. 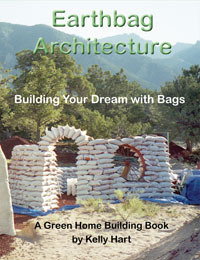 To avoid using concrete for our grade beam, we used a system called "Flexible Form Rammed Earth" or earthbag. 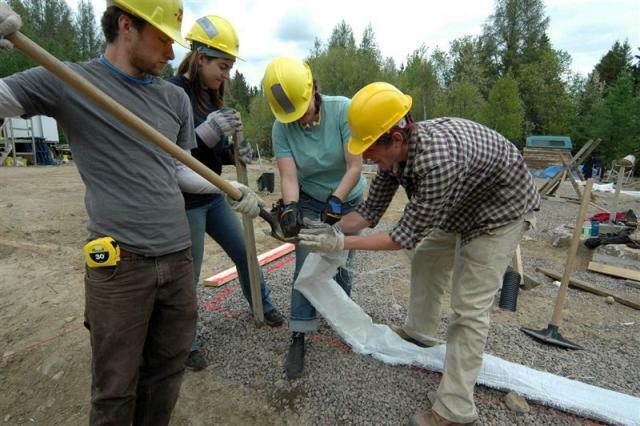 Woven polypropylene sack material (used for making feed and seed bags) is filled with a mixture of local sand, gravel, clay and a small percentage of Portland cement. The material in these sacks is then well-compacted, such that it becomes a uniform whole when it has dried. Three courses or layers of these bags bring the foundation up off the ground. Barbed wire is embedded between the layers to prevent them from slipping on each other. Flat wooden sill plates are spiked to the bags to provide a base for the walls. 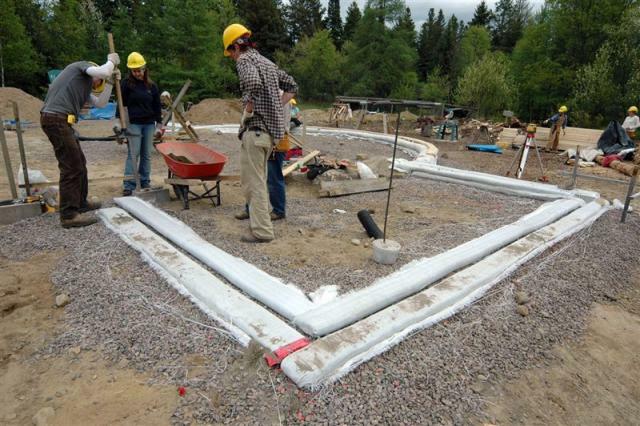 An insulation "blanket" of recycled EPS foam and used carpeting extends a minimum of 1.2m (4 feet) around the foundation. 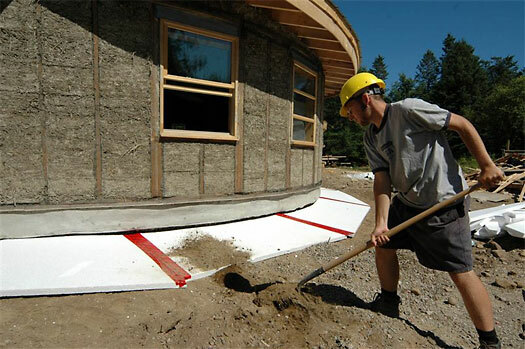 This insulation skirt protects the foundation from frost. 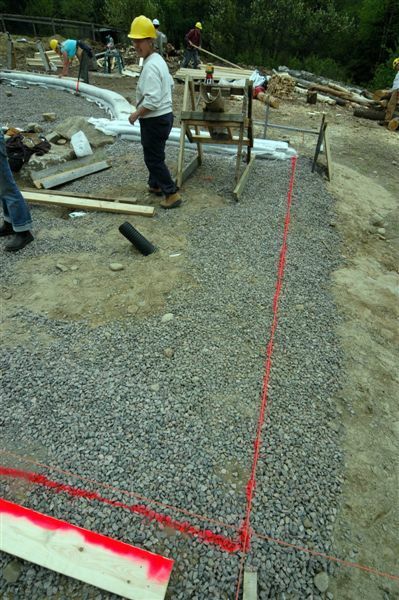 Won't a shallow, grade-beam foundation be susceptible to frost heaving? 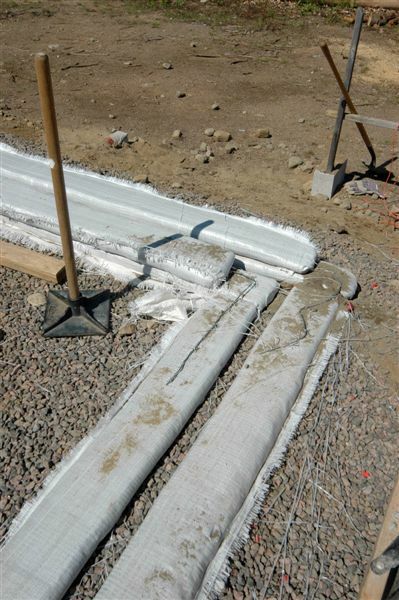 By extending an insulation blanket around the building, we prevent frost from disturbing the soil under the building's footings. Will earthbag foundations last a long time? 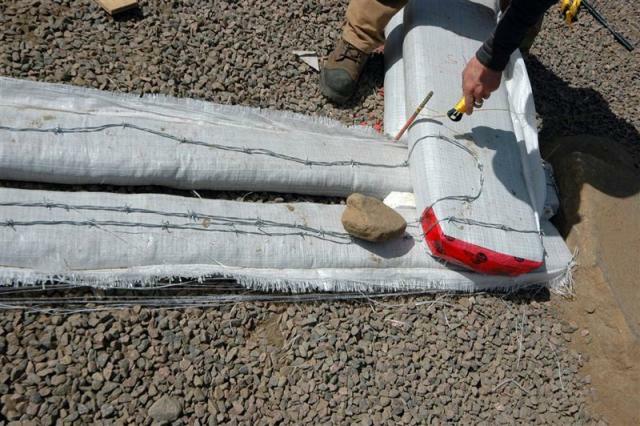 The contents of the bags (sand, gravel, clay and cement) are all long-lasting materials that do not degrade over time or lose their load-bearing characteristics. 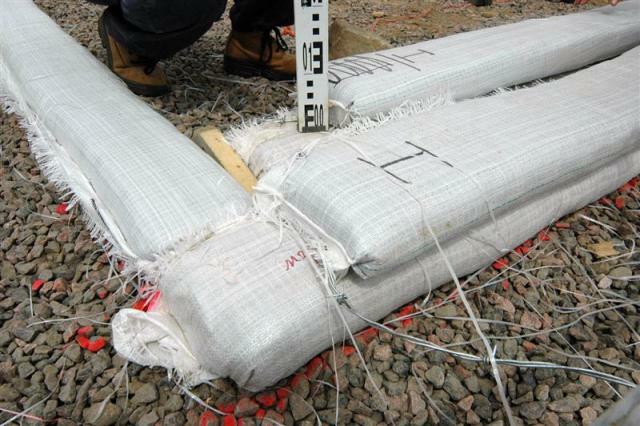 While it is impossible to predict the lifespan of the polypropylene bags, their lifespan is not critical to the success of the foundation. They are merely "forms" to contain the other materials until they are compacted and have hardened, and although they can be expected to last a long time, they are not a critical component of the final foundation. 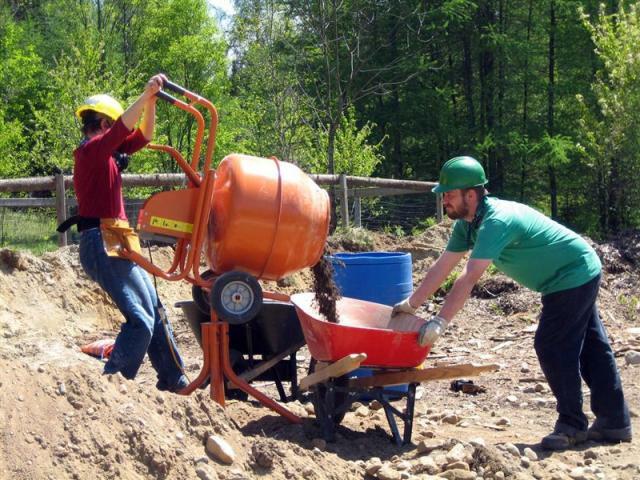 Are earthbag foundations labour intensive? 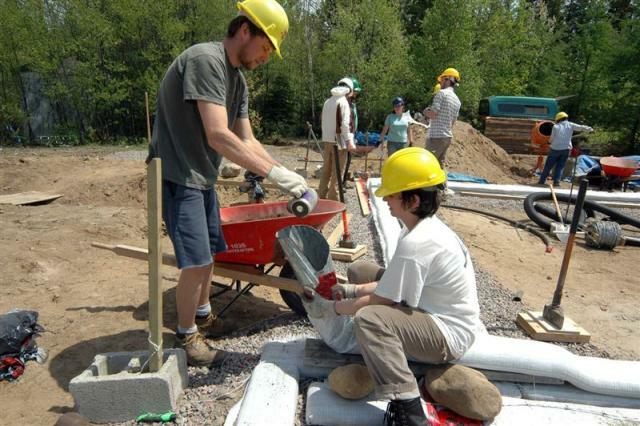 There is more manual labour involved in creating an earthbag foundation than a poured concrete or block foundation because the vast amount of the work required is performed on site. With concrete, more time and energy is expended, but it is largely mechanical and chemical energy and the work takes place off site at quarries, burning kilns, batching plants and concrete trucks. 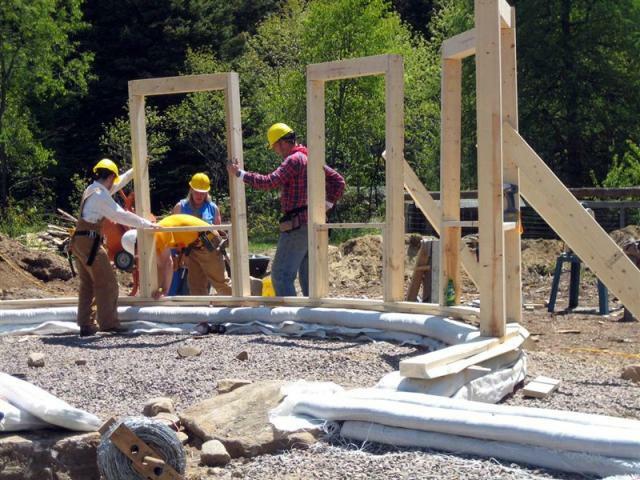 At current cost levels, the additional labour costs are offset by the low materials costs, making the foundations equal in cost and far superior in terms of environmental impact.